Panels connect together with patented Wavelock™ tabs and recesses that allow panels to join together without pins or hardware. Edge and corner panels are finished with a mill finish aluminum edge and integrated latches that connect one panel to the next to allow you to transform virtually any space into a dance venue quickly and without any tools or additional hardware. All panels are sprung on pads of closed cell foam and provide an a simple solution for temporary entertainment / dance flooring. They can be used indoors or outdoors. NOTE: Panels can be customized to different sizes and shapes as necessary. Composition: The panels are manufactured of 2 layers of ½” Moisture Resistant MDF machined to exact tolerances and glued and clamped in a vacuum clamping system to assure complete surface adhesion throughout the entire panels. The panels are sprung on discrete pads of closed cell die cut foam that are sized and positioned to optimize performance characteristics. Edge and corner panels are backed with a machined hardwood edge strip and finished with an aluminum edge with integrated hardware. Each edge and corner panel includes an integrated spring loaded latch and catch riveted to the aluminum edging. Finish: The panels are finished with a 6 part finish process comprising 2 coats of a water-based catalyzed epoxy coating, 1 coat of a catalyzed acrylic urethane sealer, and 3 coats of a super-matte catalyzed acrylic urethane finish. This finish was designed by dancers to be appropriate for a wide range of dance styles. It is furnished in a standard neutral grey, but can be custom tinted to over 30 colors. Testing and Certification: The Boston Dance Alliance Portable Floor technology has been tested on certified equipment at the American Sports Engineering and Testing Services Laboratories to meet ESTA E1.26 (2006), DIN 18032-2 (2001), and EN 1569 (1999). Panels are also certified for termite and moisture resistance. 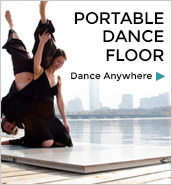 Green / LEED certifications: The Boston Dance Alliance Portable Floor panels are manufactured with concern for LEED certification and compliance. The panels are made domestically of locally sourced 100% post industrial recycled wood fiber, with no added formaldehyde. Specifically, the panel material carries, MR4 credits for recycled content, MR5 credits for locally produced materials, MR7 credits for FSC certified wood content, EQ 4.4 credits for no urea formaldehyde. They have comparable credits under Green Globe, NAHB, and CARB certification regimens. 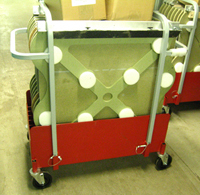 Shipping & Transport: The Boston Dance Alliance Portable Floor is sold with optional custom storage and transportation carts. Carts each hold 8 panels vertically, and have been configured for the optimal allocation of corner, edge and internal panels to provide the widest range of finish floor sizes possible. 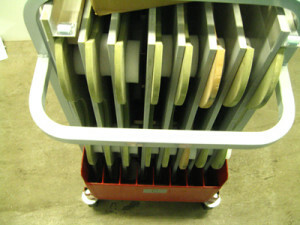 Fully loaded carts weigh upwards of 250 pounds. They can be transported by ramped truck or lift gate truck (preferred).